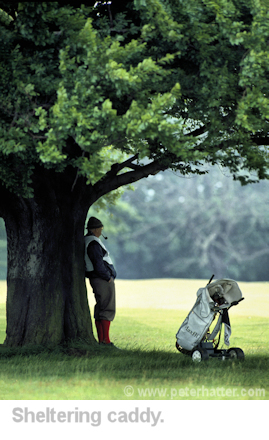 Take Your Best Sports Photographs Ever. Our 10 Tips. 1. You don’t need a press pass. There is almost a legendary status to the ‘press pass’ for sports photographers. As if this is going to lead to untold wonders of image opportunity. I can tell you now, there are just as many opportunities to be had at your local small-scale venue as there are at any mega-event that needs a necky-dangly thing to get in. Attending a big event is hard work because everyone is trying to get THE shot and it’s as competitive outside the event arena as it is in it. So forget that mind-set and think about what you can get from a football game on your local park. It’s still football, the players still run, chase, score and celebrate as much as the pros but it’s a lot easier to get the shots you want. All manner of sports take place locally if you look out for them. Athletics, cyclo-cross, mountain bike racing, basketball, canoe slalom, marathons, you name it, it’s likely there’s an event near you that will offer wonderful opportunities for great pictures. You have to seek them out (Google eh? Perfect) and get yourself to them. Events like these are going to give the best chance of getting close enough to the athletes for great shots and angles without upsetting any officials or competitors. You will likely be able to roam around and find those great positions very easily. Always remember though that you must not interfere with the event and always obey any official that gives you an instruction. If they are asking you to move then there’s probably a good reason. Think safety first. Rallying is very photogenic but also very dangerous as it’s easy to concentrate on pointing the camera at the car and forget you are in a potentially life-threatening position. Events like this are great places to start to put together a sports portfolio and the reality is without press accreditation you aren’t getting in to the big events anyway. That has to wait until you are doing it for a client and the pressure's on! 2. You don’t need huge lenses. Another great fallacy is that you can only take a sports photograph when you’re using a huge lens. Of course these help enormously when your subject is half a football pitch away and you have to get a frame-filling portrait of the latest signing for that big club. If you’re at a smaller event like a mountain bike race you are so close to the riders that you are within an arms length as they pass you. This gives you a massive choice of lens options. 50mm, 20mm or a bit tighter with a 200mm? Really, a 200mm is as long as you need in most situations. I love to work with wide lenses and fill the frame. Think creatively with the lenses you have and how you can capture that sporty scene in new and unusual ways. To add a little pulling power to your lens, add a convertor. A 1.4x times convertor will take a 200mm lens up to a 280mm with the loss of only 1 stop of light. Smaller lenses give you a smaller camera to handle and that can lead to interesting angles, high looking down, low looking up, maybe even attached to something like the crossbar of a bike. The GoPro camera is so popular because it will go anywhere and offers wonderful angles. If you can imagine putting it somewhere, someone has come up with a mount to put it there. Of course your camera is unlikely to be as small as the GoPro but you can still be creative with those positions. Capturing a great sports photograph is difficult. The action happens fast, sometimes a long way away and you never know exactly when or where the best bit of ball-kicking, hitting, catching, driving, diving or throwing is going to happen. All you know is it’s going to happen somewhere out there in front of you and your lens. There is one thing you can do to increase your chances of capturing that deciding moment, the one moment in time you have been hoping for, praying for and maybe even being paid for to capture. That thing is to know your sport. That means understanding the rules of the game and understanding how it’s played. Some of this is very basic, for instance, how long the game takes to play. If you turn up to photograph a game of Rugby for example, you need to know that you have 80 minutes, played in two halves in which to capture all of the action sports photographs you need from the event. You need to know that they swop ends after each half because you may be there to cover a particular team so at half-time you have to make your way to the other end of the pitch before the start of the second half. That would be a simple example, vital to know, but simple. Next though is an understanding of the more complex rules such as throw-ins and scrums. When you understand how these rules are applied you can predict how the play may turn out and be prepared for the flow of the action both during and after the throw-in or scrum. By knowing this you can keep in front of the expected play and follow the game through your lens, ready for the action to be captured as it unfolds. If you don’t know how it will go you can only guess at where the players will end up as they go through the motions. Trying to guess the action is not going to give you many opportunities to capture the sporting highlights of the day. That though is to understand the technical aspect of the game, also vital is understanding how the play is taking place on the field. For instance, if a team favours a certain wing for attacking along the ground, if you are situated on the wrong wing you will be unlikely to see any action within range of your camera so having observed that the majority of the play is elsewhere on the pitch you have to make sure you put yourself in a position that maximises your chances of getting that action. If you are shooting a football match for a Sunday paper, they are likely to want a shot of the winning goal. Know who is winning, or at least likely to win, means you can choose at which end of the ground to sit to capture that team scoring or attacking their opponent’s goal. So, a major sports photographer tip, know your sport, understand the rules and how it’s played. 4. Go fast, go slow. The shutter speed is one of your most powerful creative tools. You can select a slow speed for enhancing your composition with blur or you can select a fast speed to freeze the action. For a sports photographer a fast shutter speed begins around 1/500th second and can extend up to and beyond 1/8000th of a second. 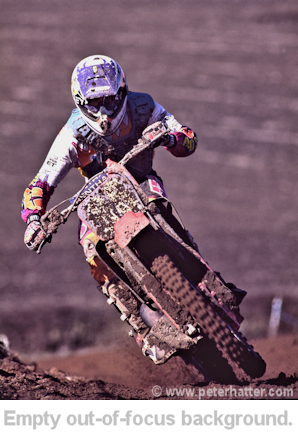 To ensure the sport is caught completely without blur then anything above 1/1000th of a second is required. Amazingly even at 1/500th the arm of a table tennis player hitting the ball would be blurred so freezing that requires a much faster speed nearer to 1/1000th. As a sports photographer you should ensure you are able to explore the possibilities of the opposite end of the shutter speed scale too. You can get most creative with slower speeds. 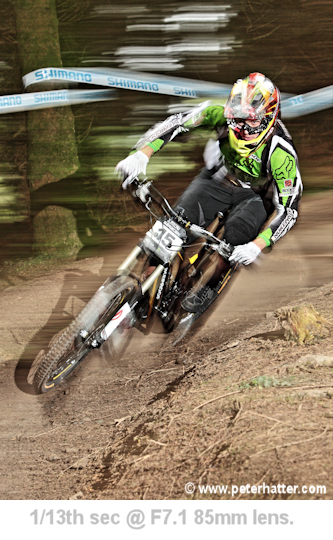 The lower speed will induce blur which brings an element of movement to your photograph. 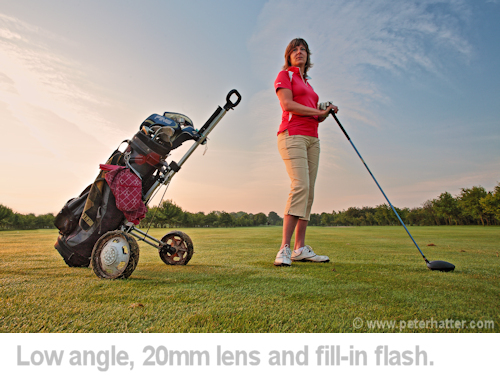 A typical slow speed might be 1/60th or less but ‘slow’ can depend very much on what you are photographing. For example if you are photographing a runner from the side of the track, pan the camera with the subject and use a shutter speed like 1/30th of a second. (We will come to panning again later.) The subject will be reasonably sharp and the background will be blurred. It looks great! However if you are panning with a racing car then your pan will be a lot faster and therefore a faster shutter speed will be used such as 1/60th. There is nothing to stop you going really slow, down to say 1/10th for the racing car, or even slower, however this is a very hit-and-miss technique so you will take lots of pictures that look awful. 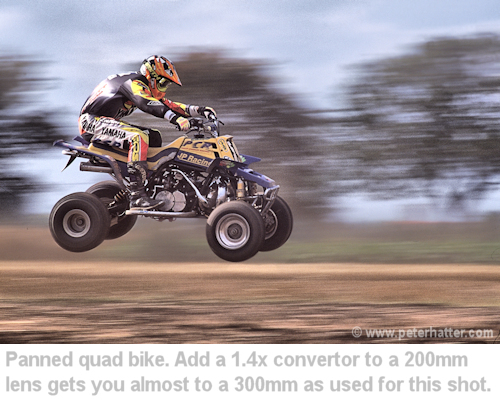 The quad bike here is a great example of a panned image shot using a slow shutter speed. See how the background streaks in line with the direction of the pan and the subject remains reasonably sharp. The shutter used here is something like 1/20th of a second in order to exploit that large pan and blur. Get this technique right and it looks brilliant but prepare to persevere as it takes practice! The technique requires you to follow a moving subject with your camera as you watch it through the viewfinder. Whilst panning the camera you press the shutter release and continue to pan the camera with the subject. The key to successful panning is timing and a steady hand. I have a few practice pans before I take a photograph for real. (This goes back to when I was shooting film and every press of the shutter meant a used frame. Oh how much I love digital). The practice pan allows you to pick out the spot at which you are happiest with the expected composition and therefore when you need to press the shutter. I will pick up my subject through the view finder as far away as possible. This gives me time to position them correctly in the frame and get used to the speed they are travelling. I then track them as they move towards me. I will have my shutter finger poised over the release and as the subject passes by at the point I have decided I will take the shot I press the shutter release. Make your shutter release action as gentle as possible to reduce the up and down movement of the camera. I then keep panning as the subject moves past me, keeping the pan as smooth as possible. This then means the blur will be in a straight line and not like a mountain range profile. Key to a good panning technique is your stance. I keep my feet a shoulder-width apart and parallel to the direction of my subject. I will then move my body from left to right (if that's the direction of my pan), only from the hips up. I expect to press the shutter when my body is completely in line, neither twisted left or right. What I look for from my panned images is a fluid background and a sharpish subject. I don't like a subject to be too blurred but a little blurring adds to the dynamic. Most of the time blur is a bad thing. It ruins what should be a sharp image. However there are times when it will make your image stand out and is a great tool to have in your creative belt. As I said previously, this is a difficult technique to master and you will take some shots that aren't up to much so you have to persevere. However when you do get it right the results are very pleasing. As with most things, practice will make perfect. A big part of being a sports photographer is the appeal of capturing the action, freezing a moment in time to reveal the drama not normally seen by the television camera or spectator. This approach requires the photographer to position themselves in the right place, press the shutter button at the right time and which will, if the photographer is any good, lead to brilliant action sports photography. Whilst this approach is one that many commercial and editorial sports photographers have to use for almost every commission, it can mean that the photographer waits, looking only for where the most action takes place in order to freeze that split-second of someone running, jumping, catching, kicking, driving, hitting or throwing. These moments happen in front of you, you know it’s going to be there somewhere within the reach of the lens, just make sure it’s pointing in the right direction and you press the shutter at the right time. Here though is where the photographer becomes a collector of moments that occur, with little or no creative input. Another side of sports photography is one of creation, using the eye, skill and creativity of the photographer to make an image. This of course still means that you are capturing a moment but it’s not the obvious high action. 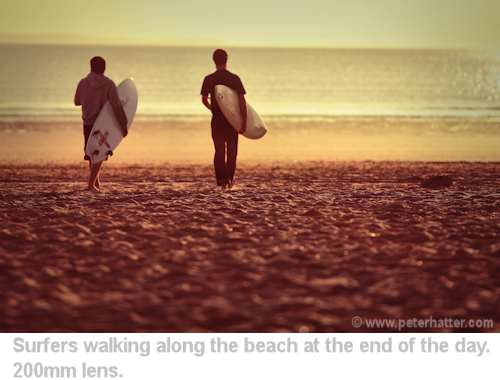 To illustrate my point I have used an example of the two surfers walking along the beach with their surfboards at sunset. Perhaps the least action any sports photograph can contain but to me it still shouts out Surfing! So look beyond the high action and use your creative eye to capture compelling sports photography. 7. See what the pros do and work out how they did it. Sports images are everywhere, some better than others but if you follow the sports photography industry you’ll quickly learn who’s producing the best work. Try to dissect the work of the best photographers to understand the techniques they used to get the shots that impress you. Then see how you can use those techniques in your work. Don’t copy images but come up with your own style. An action shot is always a good image to start with, look at the angle, the timing of the shot, what’s in the frame and what isn’t. Has flash been used? (Be careful with this as some sports absolutely don’t want flash firing in the faces of the competitors) Imagine yourself in those photographer’s shoes and see how you would go about getting that same picture. You don’t need sunlight to take great pictures. Some of my favourite images have been taken in fog, in rain. It's all too easy to look out of the window and see that it's cold, damp and miserable and human nature tells you to stay warm and cosy indoors but really this is a great opportunity lost. Bad weather makes great images! Obviously there's a need for some preparation to go out and shoot in bad weather. Always expect the worst and have cover for your gear to keep it dry. There are many specialist camera covers on the market to suit every kind of budget and camera combination. In the past I've even made a plastic cover which was held together with a bulldog clip. It wasn't elegant but it did a job. Carry your gear in a suitable bag designed for bad weather. Of course the photographer should be well-prepared too. There's nothing worse than being cold,wet and miserable in bad weather. Feeling dry and warm is more likely to encourage you to stay out there and get these kinds of shots. However always be careful and think safety first in all conditions. Consider how the weather can change and be prepared for the worst. If things are too bad go back another day. No photograph is worth risking your life. The golf caddy image below was taken in pouring rain. He's sheltering under the tree and without these crappy weather conditions I wouldn't have got that shot. Sometimes you have to make the best of the light you are given when you are taking a shot. It’s useful to be ready to work in any quality of light as this gives you maximum opportunities for your image capture. 9. Use a wide aperture. A wide aperture like f2.8 not only lets in a lot of light, it also throws the background out of focus and this makes your subject really stand out. It works best on longer lenses like 200mm or longer but even at 50mm, when you are close to your subject, for a head-and-shoulders portrait for instance, it gives a lovely blurred background. Of course this means a narrow depth-of-field so focus becomes critical. This really tests your camera’s AF system but when it’s right, it looks great. Watch the background. As soon as I am commissioned to photograph a sport, my first thought is what will the background be? If I have any choice in how I compose the picture, (sometimes as a sports photographer you have to go where you are put by officialdom) I will look for a background that will complement the subject. Generally there are two types of background. The out-of-focus (OOF) background and the background containing a lot of detail. My favourite is the OOF because this removes any distractions going on behind your subject and leaves your eye to view only the main activity in your sports photograph. This technique is achieved with standard (50mm) or longer telephoto lenses, combined with a wide aperture such as f2.8. Using a 50mm lens at f2.8 the background of for example a head and shoulders portrait will be nicely out of focus. By using this technique you are exploiting the aperture's Depth Of Field (DOF). DOF is the area of focus in front of the lens. It can be measured in centimetres or kilometres. A wide aperture like f2.8 gives you a short depth of field (or area of sharp focus) in which you place your subject. Anything outside the area of depth of field is out of focus. (A new word for this out of focus area is bokeh and very popular now). However there may be a time when the sport you a photographing takes place somewhere that adds so much to the sense of what is happening in your shot that it would be a missed opportunity not to include it. Time then to take that photograph using a smaller aperture like f8. As the aperture becomes smaller, the area in focus extends in front of and behind the subject (Assuming of course the subject is in perfect focus no matter what the aperture is set to.) A typical sport where this might apply is a fell running event where the race takes place in a landscape that would be ripe for a photograph even if there were no sporting action taking place. So by reducing that aperture and extending that depth of field more of the background is revealed to the viewer of your sports picture. Fill-in flash can be an odd technique to get your head around, why use flash outside? Leave that question behind and it’s well worth the effort to understand how and why it's a well-used technique amongst the pros. The idea is to balance the light of the flash with the ambient light. I'm a huge fan of using fill-in as it adds such impact to the subject, drawing them out of the background, making them 'pop'. It's quite easy to manipulate the settings of the camera to darken the background and make the subject pop even more. There's also a case for using fill-in to enhance the existing light without making it obvious that this has been done. Take the golfer portrait above, I used fill-in flash for this image but it's not in anyway obvious. Compare that to the mountain bike racer here. The light looks great but it's obvious flash has been used. There are times to be blatant and times when subtlety is required. Also useful and very effective is the use of slow shutter speeds to bring in a degree of blur. 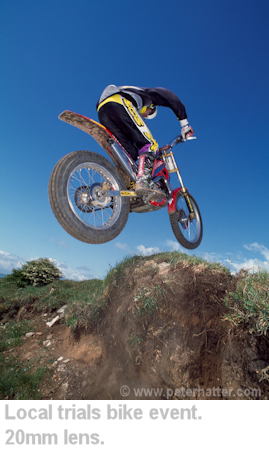 The mountain biker was shot at 1/13th of a second so the movement of the rider adds the blur but then the flash of fill-in light freezes the rider to add the sharpness. This also uses 'second-curtain-sync' where the flash fires at the end of the exposure. This means the blur occurs behind the rider as the flash fires at the last moment. First-curtain-sync fires at the start of the exposure so the blur would occur in front of the rider. Fill-in flash is a brilliant addition to your technique skill-set but it needs practice to understand and some time spent with the camera's manual to apply it properly. There's a good reason why pros use this technique so much in their work, images jump off the page. Yours can too. Always be careful when using flash at sporting events. Some allow it and some don't. Ensure you aren't interfering with the competitors by using flash. This last image sums up everything this article is trying to explain, it was taken at a low key event that offered easy access to everyone, the pros took their images from the same places as everyone else up on the hill, there's no expensive long lens used to get this picture and the flash made the picture pop. I hope these 10 points help you get great sports images. Let us know how you get on in the comments below. All images in this article are © www.PeterHatter.com No unauthorised use.